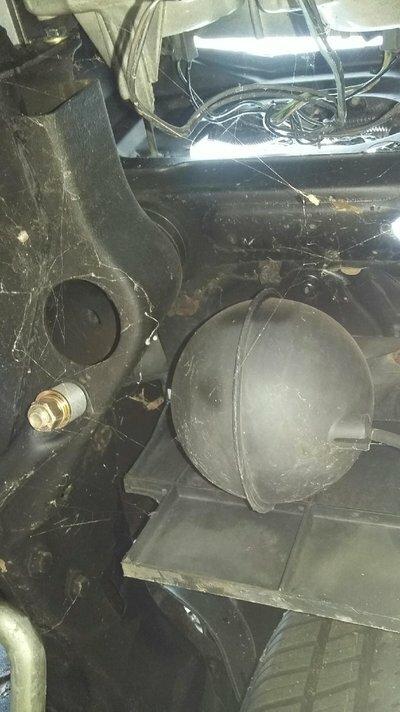 What is the function of this vacuum ball mounted to the front core support in my 86' Regal? So basically what do I need it for. 565 BBC,Merlin Race Block,Callies Crank,Eagle 6.535L19 Rods,Cam Motion Custom Roller 4/7 swap cam,AFR CNC335 heads all Manley parts,Ported Super Victor,Quickfuel 1150,MSD 7AL-3,HVC coil,billet dist,timing computer. Lemon's Headers 2-1/4" to 2-3/8" to 4-1/2". 2 chamber Flowmasters with 4" tailpipes over the axle.TCI 400 full manual competition trans,4000 stall, Moser 9" Detroit Locker, 410 gear,Wilwood disc,Zex Nitrous, etc. "I have a habit of not leaving well enough alone"
It keeps your car from exploding. No, seriously tho, it’s a vacuum reservoir. If you don’t like the look of it, hide it. You need it if you run pretty much anything that uses engine vacuum. It may have more bearing on the vacuum controlled cruise? Since my swap eliminated that, I hadn't reinstalled the ball. The only things vacuum hooked up are the vent selector and the brake booster. Then, during some hare-brained trouble shooting, I installed the ball, but mine is a single port. I teed it inline to the vent controls, and noticed no difference. Your results may vary. 02 Firebird/85 Bonneville Mashup "Lipstick on a Pig"
The idea is to be just as stated. A reservoir for vacuum. Similar to the way the brake booster works. As some of the vacuum-operated items are doing their thing, the hope is that the reservoir keeps the vacuum signal steady in relation to the engine vacuum. If vacuum fluctuates, you may start having those vacuum operations go snake shiit on you. Thus, customer complaints. Thus, engineers get yelled at. As far as how effective they are.....I guess the engineers figured they needed it. There is another one under the driver's side that appears to have a single hose going to it do one of these supply the AC? Ive always seen the 2 port balls (teehee) used for the hvac controls and the single port for cruise. 2017: 1970 315hp/410ftlb Buick 350 Code SP Stock w/ 800cfm Qjet and Crower Level 3 cam and TH350 #2 (rip). Now with TH350 #3 with TransGo 350-1-2 Shift Kit, 2500 stall Hughes Converter, GN 8.5 posi with 3.42s. Does Consistent 10.3 @ 72mph in the 1/8th with 2.41s/1200 stall. 1/8th with 2500/3.42 TBD. Looking for 9.0. I was also thinking that since they are on their respective sides of the car. I'm not sure which is which but I know one is for cruise control. For cruise control vacuum system, you can use the 2 port check valve set up as shown or 3-port system shown in the inset which gets rid of the 2 port check valve. 1980 Malibu BBC T-56 9"
1986 Cutlass SBO Auto 8.5"
The beauty of the Second Amendment is that it will not be needed until they try to take it. Tall lower ball joint with drop spindles? Setting Q-jet vacuum pull off? Ham Radio Academy - Learn Ham Radio! copyright ©2018 Ripp Technical Services, All Rights Reserved.